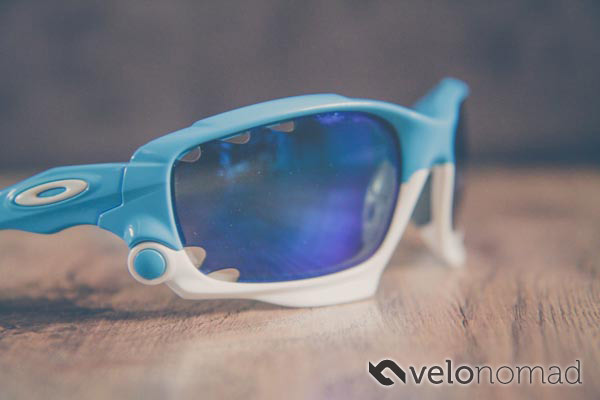 In this Walleva Lenses Review, one thing became startlingly obvious: Oakley has become such a dominant force that it’s hard to review another sunglasses product without anchoring to a comparison with Oakley. Rightly or wrongly (I think rightly), Oakley is the gold standard by which all other lenses are judged. I honestly cannot think of another market where one eyewear brand dominates so clearly (maybe cricket or baseball). 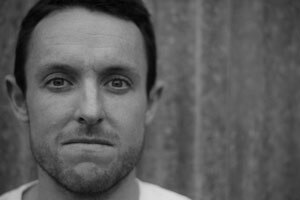 Snow, surf and moto have a much more even spread of brands. I have an ingrained personal bias, probably due to the excellence of Oakley’s marketing department, and of course the products themselves, such that it becomes very difficult to judge other lenses: it makes it hard to review glasses and lenses on their own merits. This is especially true in a world where you can OEM pretty much anything out of China to a (usually) high standard. In order to bring a bit of objectivity to this Walleva Lenses Review, I decided to look at what standards Oakley lenses meet and see how Walleva Lenses perform. Then, we’ll discuss actual optical performance. Lastly, we talk price and whether these are worth your money. Naturally, I end up mentioning Oakley even though this is a Walleva lenses review as most people will be reading these types of review as a type of Walleva lenses vs Oakley comparison, in order to compare the two brands to help decide whether to buy Oakley lenses or whether Walleva lenses are good enough. Walleva very kindly sent an Ice Blue and Fire Red lens set, both of which are polarised. I prefer to wear polarised lenses on the road, as asphalt reflects between 4 and 10% of UV and concrete 8-12%. It’s not trivial, but over time certainly increases your UV exposure. I tested both sets on the road in sunny and overcast conditions, in dry/cool conditions and in humid/wet conditions. I tested them whilst running and cycling. I tested the Ice Blue and Fire Red, both with base colour of grey and light transmission of 16%. I’ve always viewed sunglasses as a safety item: they filter UV light and protect your eyes from flying objects. With a golfing background, my beloved circa 1994 M Frames lasted 13 years, serving me well and protecting my eyes on many good rounds (and too many bad ones), protecting my eyes on the bike, before meeting an untimely end in a road cycling accident. So to me, their performance in protecting your eyes from UV as well as projectiles is my number 1 consideration. With Oakley, I don’t think about this at all: I just know they’re awesome. So how do we judge impact protection and UV performance in Walleva lenses and in the context of Walleva vs Oakley lenses. There is one gold standard that glasses should aim to meet: ANSI Z87.1. This is a safety glasses standard, and most Oakleys meet this standard. There’s also the ANSI Z80.3 which specifies standards for Non-prescription Sunglass and Fashion Eyewear. ANSI Z87.1 has rigorous requirements for impact resistance, discussed below. In Z80.1, the The test consists of a 5/8-in. steel ball, weighing 0.56 oz. being dropped on the lens from a height of 50 in. Imagine a marble being dropped from the height of light switch on the wall and you’ll get the idea. There is no test for frame strength, safety, or durability under Z80.3. There are four impact tests in this standard. In the lowest level test, a 1-in. steel ball dropped onto the lens from a height of 50 in. is required of all Z87.1 eyewear. The impact is like that of missing a golf ball thrown to you from just a few feet away and having it hit your eye. This does not, however, qualify the eyeglasses for use where there may be an impact hazard. In order for Z87.1 eyewear to be impact rated it must pass three additional, more severe tests. High-mass impact testing uses a steel missile weighing 17.6 oz. dropped from a 50-in. height. This impact is similar to getting hit in the eye with the end of a shovel handle. High-velocity impact testing fires a 0.25-in. steel ball weighing 0.037 oz. at 150 ft. per second (about 100 mph) at the lens. Think of this as being shot in the eye with a BB gun. The penetration test drops a “needle” weighing 1.56 oz. from 50 in. away. This is like a dart tossed at your eye. As you might suspect, lens retention is also an important factor in safe sunwear, and this standard describes lens retention requirements. Note that in the United States, compliance with the Z87.1 standard is self-certified, based on test results generated by the manufacturer as part of its initial design and ongoing Quality Control procedures. No independent certification is required. Products meeting the standard will carry a “Z87+” marking on the lens(es) and frame. The high-mass impact test requires that the lens be hit by a 500-gram metal spike (over a pound of weight) dropped from a height of 130cm. To pass the test, no frame parts or lens fragments that could damage the eye may be ejected during impact. This test simulates large projectile objects in close quarter combat. So, how do Walleva lenses perform in terms of impact resistance. The Walleva lenses I tested meet the lower ANSI Z80 standard, which tests a ball being dropped onto the lens: think of a metal marble being dropped on a lenses from a height of about 1.25m. This test does not test frame strength, safety, or durability. So on this count, the Walleva lenses vs Oakley scratch match results in a win to Oakley, for these polarised lenses. Many of Walleva’s other lenses meet the more rigorous standard. However, let’s put this into perspective: Oakley products often meet MilSpec standard: Australian SAS wear Oakley M-Frames. ‘Nuff said. Ask yourself: in the course of riding a bike, are you likely to need eye protection that the Australian SAS (arguably amongst the best special forces in the world) need? I’d say not. So in this regard, Walleva lenses’ impact resistance is probably fine. For this test, a pneumatic cannon accelerates a 1.27cm steel shot (0.25”) to 164 km/h. The lens is targeted straight on from three different heights and at seven different angles. To pass the high-velocity test, no contact between the lens and eye is permitted during impact. In addition, no frame parts or lens fragments that could damage the eye may be ejected during impact. All Oakley lenses pass this test. Walleva lenses do not conform to the high velocity impact standard. UVA rays (315-400nm): lower in energy but penetrates more deeply than UVB rays. UVB (280-315nm): high-energy UV ray that causes the most damage to eyes. HEV (High Energy Visible) wavelengths (blue light rays): HEV light has been linked to several forms of eye damage including macular degeneration. In addition to protection, blocking this wavelength is a performance benefit because blue light rays are a major factor in glare. UV protection is governed by 3 key standards. EN 1836:2005 which has 4 UV transmission ratings: you only want glasses that are rated 7. AS/NZS 1067:2003: you want a rating of 3 (rating 4 is the highest but you can’t drive with these on). For reference, Oakley Plutonite lenses filters out 100% of all UVA, UVB, UVC and Plutonite lenses block HEV. Walleva lenses filter out 99% of UVA and 99.5% of UVB, exceeding ANSI Z80.3 and EN 1836:2005 standards. Since ANSI calls for transmission of no more than 1% UVB and 0.3 of UVA, they are better than this. Since ANSI Z80.3 doesn’t specify a UVC test, there’s no UVC data for Walleva lenses. Walleva lenses are dust and water repellant. I don’t know how to assess a manufacturer’s claims glasses are water repellant. I’ve never worn a pair of glasses with lenses that are truly water repellant. If you ride in rain, you’ll have water beading on the lens. My idea of water repellent is an invisible force field causing water to explode upon impact like a Death Star force field. Walleva lenses do not have a force field that causes water to explode upon impact like a Death Star force field. 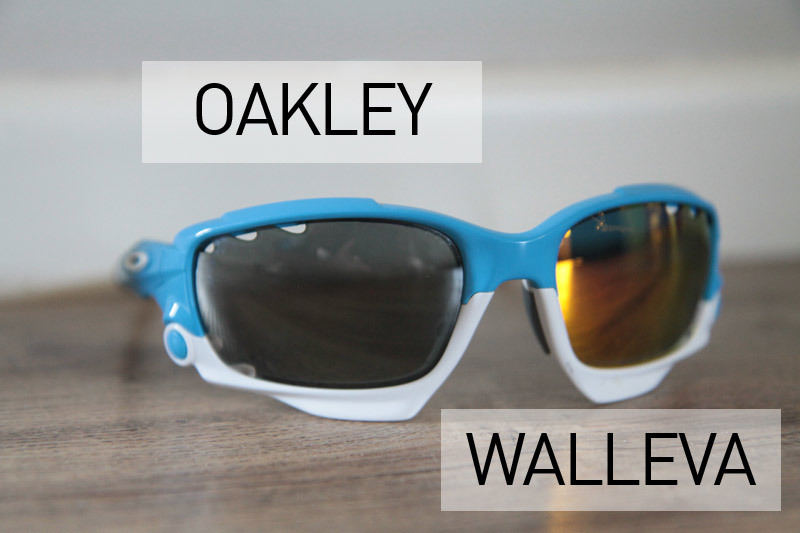 Honestly, I could not tell the difference between an Oakley lens and Walleva lens. The polarisation effects you notice were identical to high end lenses. The fire red produced a blue tinge that I didn’t like. The ice blue produced a very nice filtering and were fantastic to ride on the road with. To be brutally honest with you, I would say it depends. Walleva lenses are around 1/4 of the price of Oakley lenses, obviously without the Oakley cachet. Their lenses don’t quite meet the same impact resistance standards that Oakley meet, but they’re good enough. Their UV filtering is nearly 100% of the spectrum detailed in the applicable standards, so they’re up to par. Personally though, I only have one set of eyes, so I opt for higher-standard lenses, which means Oakley. They offer free worldwide shipping and prices lower than Amazon/ebay with a coupon code prominently displayed on their site. Some things are a bit “off” on their website, but this is a bit subjective. As an example, there’s some polish missing from the website, and there are some typos and strange grammar, but that’s nitpicking. Overall, I think Walleva lenses are worth a look, and you can buy them directly from Walleva, or from Amazon. Disclosure: Walleva provided Velonomad 2 sets of lenses free of charge for the Velonomad Walleva lenses review. Walleva Lenses Review: Should you buy Walleva lenses? To be brutally honest with you, I would say it depends. Their UV filtering is nearly 100% of the spectrum detailed in the applicable standards, so they’re up to par.